Chiang Mai – Chiang Mai Airport is progressing with its development plan to reduce congestion and accommodate more than 16 million passengers per year in the future. General Manager of Chiang Mai Airport, Sqn. Ldr. 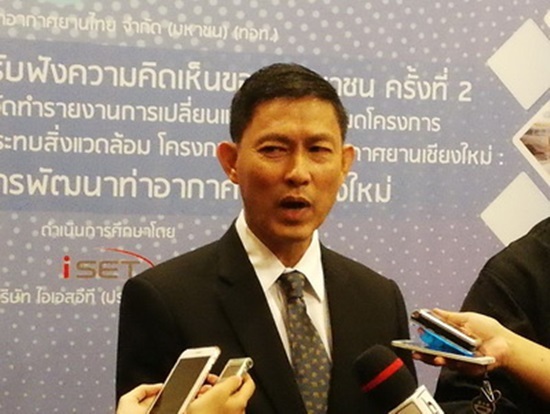 Monthanik Rakngam, said Chiang Mai Airport is currently operating over its capacity due to the rise in international arrivals and increasing settlement in the northern province. The airport currently serves some 250 daily flights, with 35,000 daily passengers, or some 10 million annually. The airport’s expansion, which requires input from nearby communities, will commence in 2020. It will include a new passenger terminal that will help to double the passenger capacity, a new airport office building, and a new five-storey parking lot that will add 2,000 more parking spaces. This expansion will cost 15 billion baht, and is scheduled to be completed in 2025.